With over 160 soccer drills, SoccerXpert is an invaluable resource for both novice and advanced coaches. We continue to add new games and drills to allow for variety in your training sessions. Planning a youth soccer practice is now easier than ever with the help of SoccerXpert and our free drills. Browse our Soccer Drills Today! Browse Soccer Drills! Quickly get topic specific soccer drills by selecting the age of your team then choose the theme of your training session. You will save valuable time preparing for practices and training sessions. Bottom line, drills help develop better players more quickly. We make it easy to print to take with you to practice or to share it with other coaches. It is easy to share what you have found with other coaches via email, Facebook, or Twitter. SoccerXpert is ideal for coaching directors, youth soccer associations, clubs, or peers of coaches. SoccerXpert.com's easy to use online coaching resource for novice and advanced soccer (football) coaches. Our soccer (football) drills, soccer tips, and fun soccer games aid the soccer (football) coach in the planning and organization of their team's training sessions. Our soccer (football) drills assist the coach in every age group and skill level. Whether you are looking for soccer drills for kids, high school, or adults teams, we have the exercises to target all skill levels organized by age. 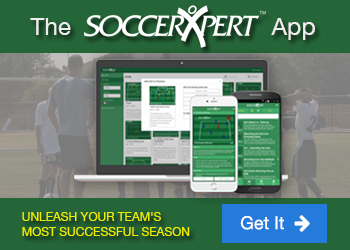 Planning a youth soccer practice is now easier than ever with the help of SoccerXpert. The Zig-Zag soccer dribbling drill focuses on dribbling with speed with the inside, the outside, and the bottom of the foot. The hot-box passing and receiving soccer drill focuses on small group and individual passing and receiving skills.